If you've never experienced serious hail—we're talking golf-ball-sized chunks of ice (or larger) raining down on you—consider yourself lucky. It can do serious damage to your property, your home, and unless it's wrapped in this gigantic external airbag, your car. 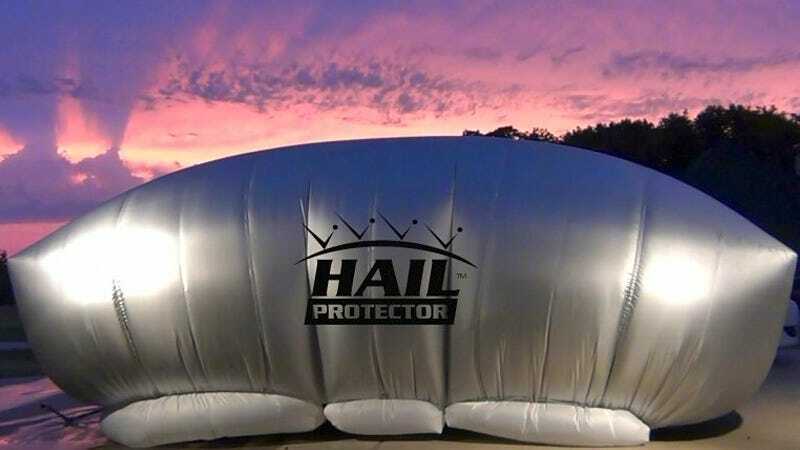 When the weather is fair, the Hail Protector looks like your run-of-the-mill car tarp that's protecting your vehicle from scratches, bird bombs, and the sun's rays. But when the weather turns nasty, using an included remote it can be inflated in about five minutes to protect your car from chunks of hail, even as large as softballs its creators claim.